I am very grateful to all who took part in what was a joyous celebration of all that we love about our unique tradition. AVMM performed two long sets at Wardington Village Fete on Saturday 1 September and were warmly received by an appreciative crowd – especially when more than half a dozen children joined us for an audience participation version of Shepherd’s Hey. 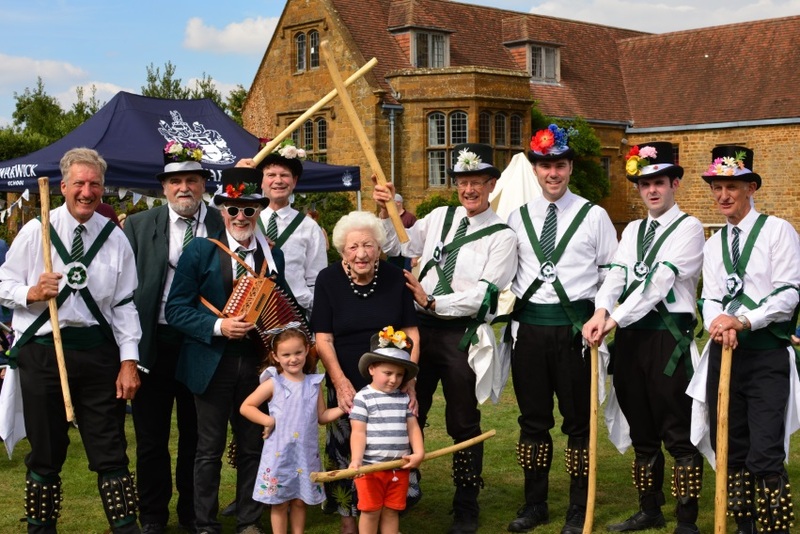 But it wasn’t just enthusiastic youngsters, bounding out from the crowd came Wardington’s oldest resident – Evelyn Phillips, aged 100! Evelyn told us that she is a lifelong dancer and she immediately picked-up the movements and steps, dancing near to the youngest member of her family aged 2. With five generations of the Phillips family present and an age gap of 98 years between the youngest and most senior dancers, this is a perfect example of the universal appeal of dance! At the conclusion of the event, the organiser immediately re-booked us for next year’s Fete and we’ll hope that Evelyn can join us then too. 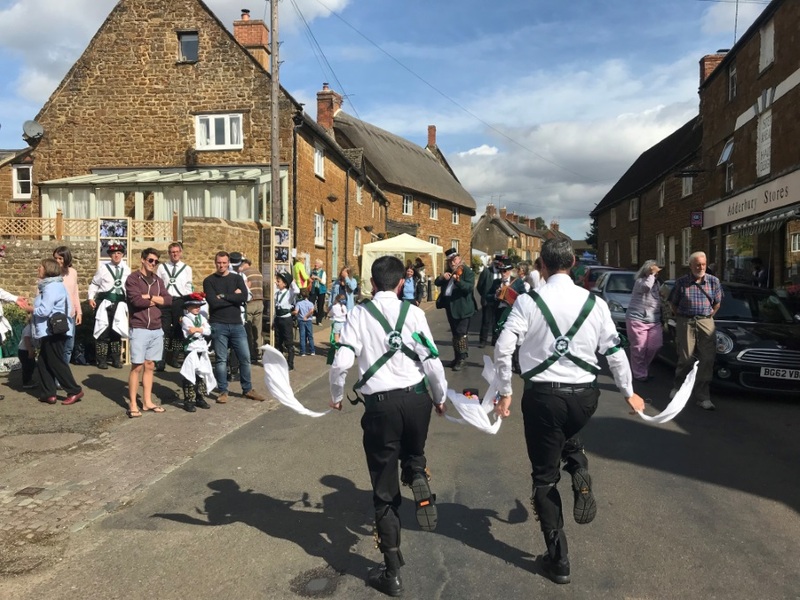 We are proud of the fact that we now have a number of keen young Morris dancers in the side and in seven year old Dylan, probably the youngest dancer in the country to know and be able to perform a respectable version of all the Adderbury dances as performed by AVMM. After a somewhat troublesome crossing of the channel by some (!) the side (9 dancers, 1 musician and 10 friends and family) assembled in La Belle France for a third tour of the war graves. For many of the dancers and their families this was their first of these tours and there was a keen sense of anticipation on the Thursday evening / Friday morning when we arrived. Friday saw some of the highest temperatures the Picardy region has had in many a year, this in turn was met with some of the hottest dancing the AVMM have done in some time! 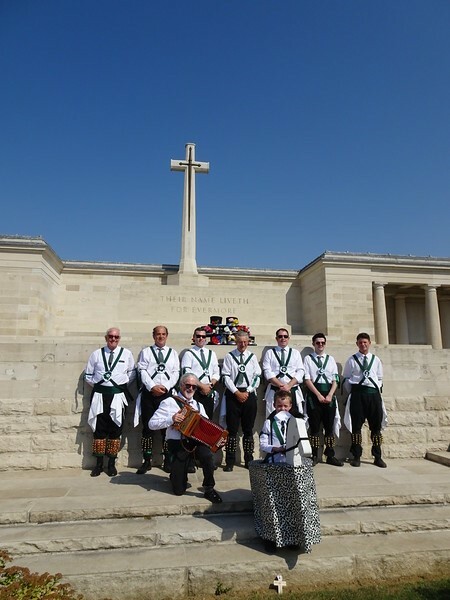 The day started with the short drive to the war graves in Pozieres, where we paid tribute to those that fought and died in this part of France through our own brand of song and dance – in particular to Ronald Pargeter from the Adderbury Morris side. Three of the touring party have strong links to Bloxham School and took time to pay respects to an ex school Captain – Arthur Stevens who lies here. As with everywhere we went these graves were immaculately looked after and readily available plans meant finding the AVMM dancers was easy. Congratulations should go to the Commonwealth War Graves Commission for their continual work in this regard. 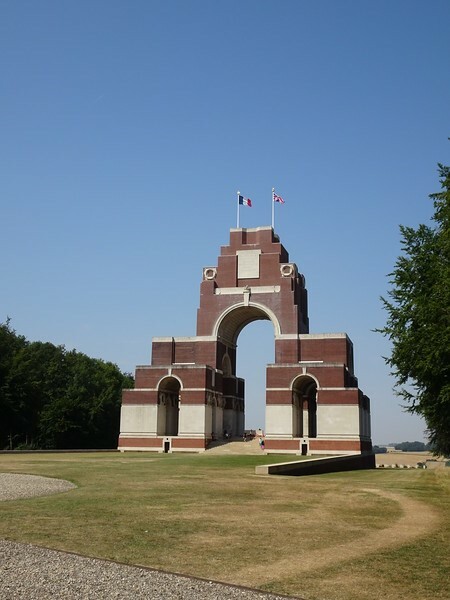 The short drive to the Thiepval memorial allowed us to reflect on the enormity of the battles in the First World War and the number of people lost on all sides – which is reflected excellently in the song penned by our musician Donald – we sang this a number of times and its power never diminished. The size of the Thiepval memorial really brings this loss into focus. We paid our respects to Percy Pargeter here and singing and dancing here felt very special and for me personally singing about the ‘…generation lost and gone who will never dance again…’ here was a significant moment. Lunch was had in the lovely Le Corner pub in Albert where we replenished our energies and rewarded the landlord and landlady for their efforts with our version of ‘Landlord’ (under the air-conditioning!). After managing to find some shade in the picturesque main square of Albert we ran through a good number of stick and hankie dances before taking a rest prior to the evening’s festivities. In the evening we were the guests of honour at the Son et Lumiere show in Pozieres. This sound and light spectacular portrays the story of WW1. As part of the show they depict normal British life in the run up to the war featuring George Butterworth (an English composer and Morris dancer) who died here in the war. AVMM danced as part of this reflecting George Butterworth’s love of Morris dancing in the pre-war years. It was lovely to be involved in something that really felt like a community organisation paying tribute to the efforts of people 100 years ago and for this evening we were truly welcomed into their community. The following morning we all made our way over the border into Belgium and assembled by the cloth hall in Ypers. We performed some dancing here before walking the short distance to the Menin Gate. 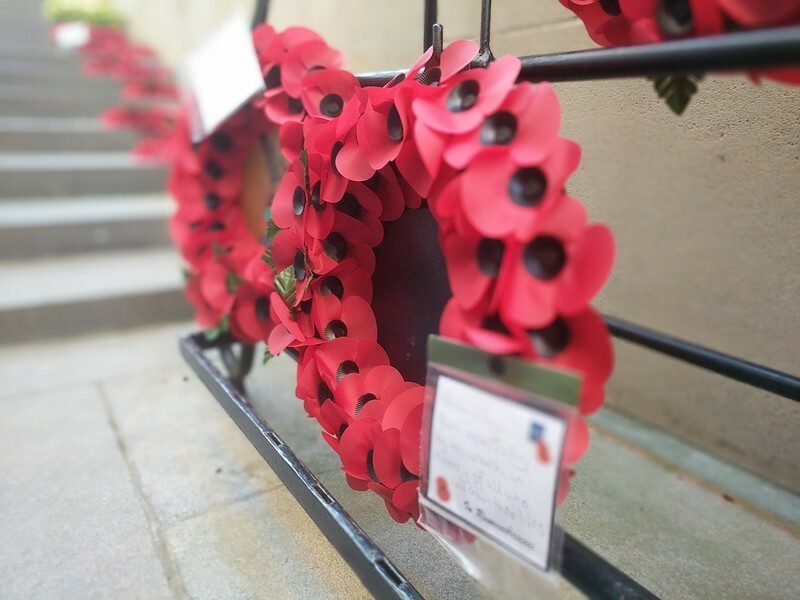 Here we were honoured to be able to lay a wreath as part of the last post ceremony. This was an emotional event for all of the side and our family who accompanied us on the tour made all the more so by the excellent Stockport Schools brass band playing as part of the ceremony. It was very powerful to see the number of people attending the last post ceremony and heartening that the millions lost are still remembered by so many. There was some debate on twitter about this ceremony with a few people keen for it to return to a simple playing of the Last Post on bugle. However it seems that all who saw AVMM were impressed with the dignity and respectful way we conducted ourselves and I hope in some way persuaded the traditionalists that our uniform is a valid as any other. Being part of a ceremony such as this feels very important and it is an honour for the side to be able to do once again. That evening then allowed for a gentle sampling of a few lovely Belgian beers before and after dinner which were all excellent and this time really allowed the side to get to know each other outside of the dancing sphere. Sunday started with a tour of the excellent Passchendaele museum – which comes highly recommended before the short drive to the Tyne Cot memorial (where George Robins’ memorial is) where a relatively large audience saw our final song and dance performance bringing an excellent tour to a conclusion. I personally wish to thank John Ekers for his excellent organisation of this tour and it was a great shame Bryan Sheppard, our fool, was unable to join us on this occasion due to ill health. His contacts and organisation of previous tours played a large part in helping make this one successful. and the whole side showcased a variety of stick and hanky dances with Postman’s Knock and Brighton Camp being particularly impressive. Landlord Simon Finch thanked the side for their performance and offered a free drink for the whole team. However, such are the levels of dedication to fitness and sobriety amongst the current side that water was the chosen drink of choice. Like a scene taken from Thomas Hardy’s ‘The Woodlanders’, on a breezy, bright mid-June evening, two AVMM men and a visiting New Zealander met with David Best of Barford St John in the bucolic setting of the meadows by the Barford bridge, where David very kindly offered us a pick of the best growth from the stocks of his pollarded willows. 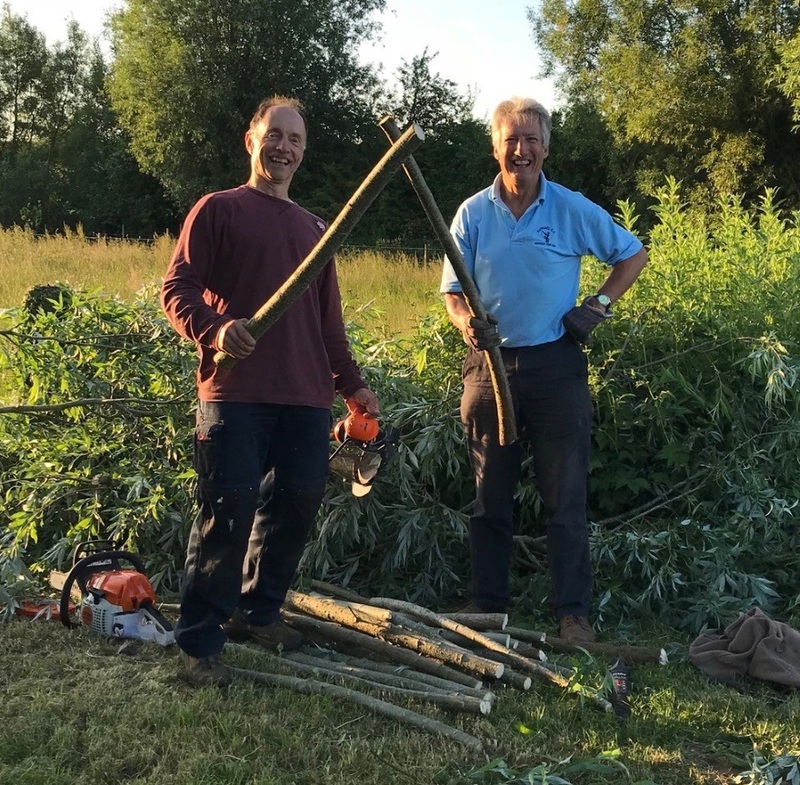 It was surprisingly tricky to find a straight length of 39 inches with just the right diameter, but after having demolished half of David’s row of willows, we came away with over a score of beauties. 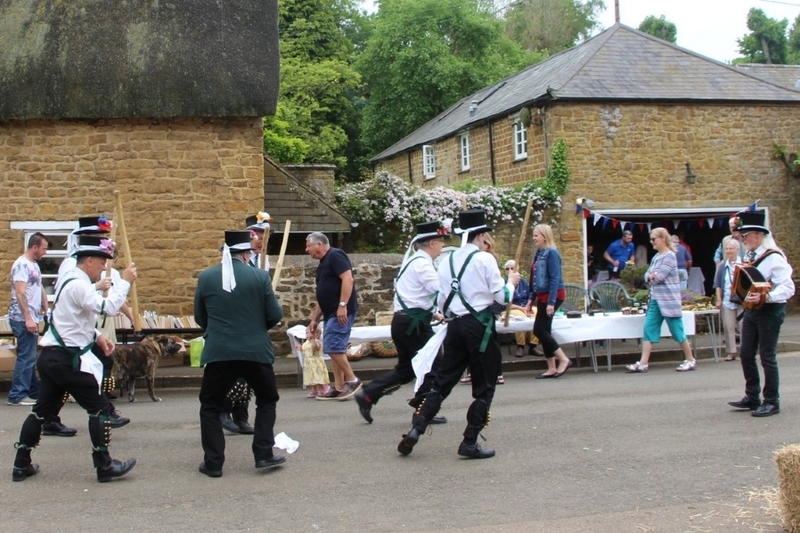 The sticks will be stripped using a draw knife once owned by another Adderbury man, the late Arthur Spencer of The Parish; by next Spring they will be seasoned and will clash for the first time at the Day of Dance, when the cycle of the year turns again. Heartfelt thanks to David Best for providing us with a new stock! 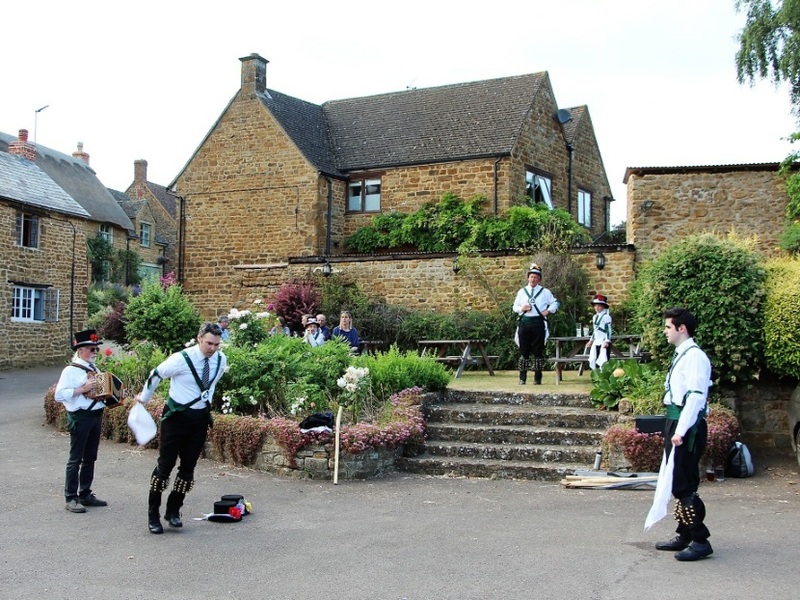 On a warm evening in June all three Adderbury Morris sides decided to get together and celebrate our different traditions outside local pubs for no particular reason other than our shared love of dance and camaraderie. 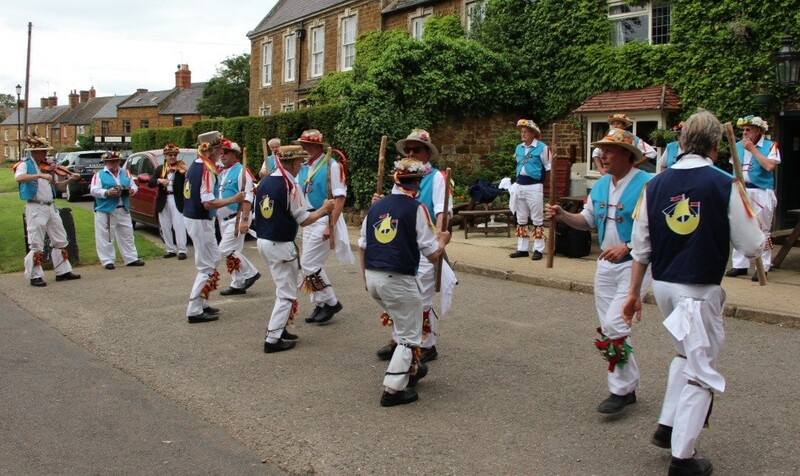 Adderbury Village turned up in good numbers and kicked off proceedings in front of a discerning crowd at The Bell. Sharp & Blunt and Adderbury Morris began their evening later at The Red Lion and then joined us outside The Coach and Horses by the village green, before all three sides returned to The Bell to dance until dusk. AVMM were pleased to have the opportunity to showcase many of the dances they plan to perform on their forthcoming summer tour of the Somme battlefields in July. AVMM also attempted to extend their unofficial world record attempt for the most dancers to perform Brighton Camp (24 dancers supported by 5 musicians). We danced for well over two hours maintaining a high standard throughout and although our oldest dancer on the night was ten times as old as our youngest, all the side performed with the same youthful vigour! An afternoon dancing for the senior citizens at Chacombe Park Nursing home was the latest AVMM performance. 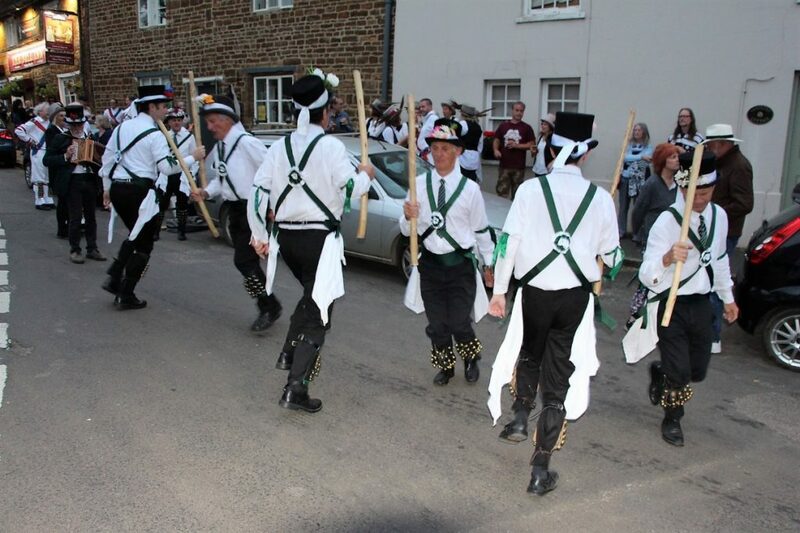 With the advancing age profile of most Morris sides we are particularly respectful of this group of Chacombe residents. However with Theo present we were able to show some real youthful dancing. It is purely coincidentally that he was then made the target for a firing squad of wet sponges ! No it was not the climax to shooting, this time, just one of the fetes sideshows. To the delight of every one he survived for the next dance. 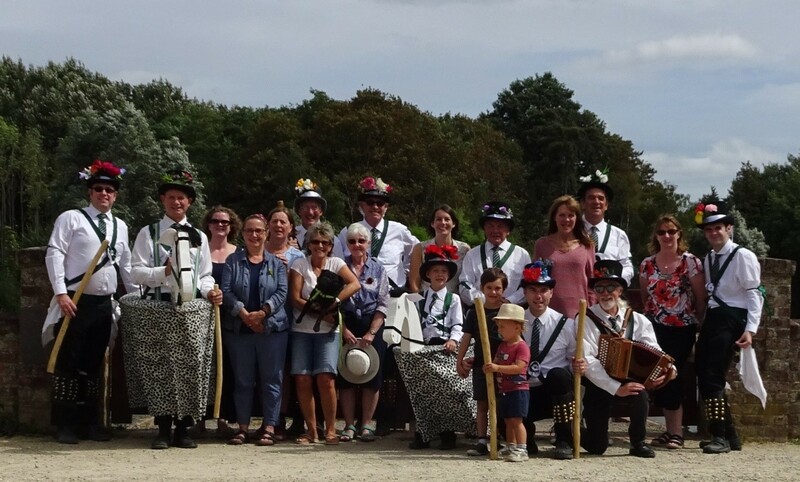 It was a pleasure to be part of the fete and perform our dances for the large audience of residents and spectators who particularly applauded our eight dancers, two musicians and one horse version of Brighton Camp. I would write more, however ‘I must return to the girl I left behind me.’ ……….in Brighton. 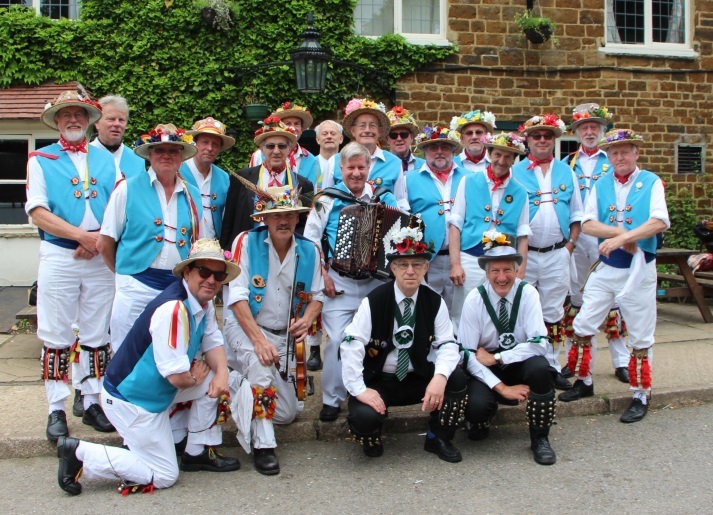 AVMM once again entertained the good folk of Wroxton at their Whitsun Fete. Our set was positioned between a dog show and a magician and so it is appropriate to say that our performance was both cute and magical. The masses were regaled with an array of our unique dances. A particular highlight was the firing squad at the end of ‘Shooting’ – ending the life of one of our musicians . The bad news is that he was revived by the kiss of a fair damsel in time to play Brighton Camp. Dancing, joy and mirth. What more can you want? Oh yes, nice weather, no rain, a dog show and a magician. Roll on next year – magic! 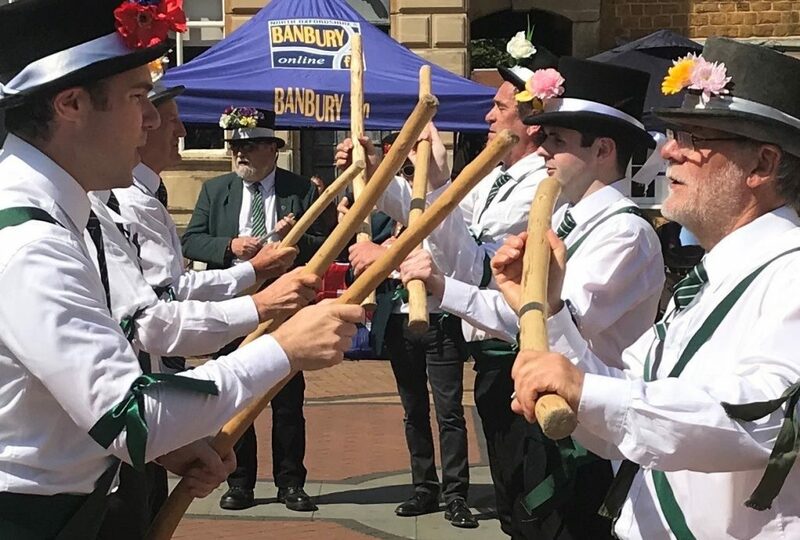 AVMM were happy to participate for the first time in the Banbury Friendship Festival (AVMM is also the first Morris side to dance at this festival). The event is an annual celebration of friendship and the cultural diversity that exists in this part of north Oxfordshire. On a very hot afternoon in Banbury market place, nine dancers and two musicians entertained a decent crowd during a 45 minute set which featured a broad selection of our dances. The level of performance remained high despite the heat – although the call to dance “Black Joke” seemed to be greeted with slightly less enthusiasm by our dancers than is usual! Our last dance and audience participation number, “Brighton Camp” introduced four enthusiastic newcomers to the delights of Cotswold Morris and the close attention of Charlie the Horse. I hope that some, at least, will wish to learn more about AVMM’s unique style and get in touch about attending future practices.